Using conjoint choice experiments, we surveyed 473 Swiss homeowners about their preferences for energy efficiency home renovations. We find that homeowners are responsive to the upfront costs of the renovation projects, government-offered rebates, savings in energy expenses, time horizon over which such savings would be realized, and thermal comfort improvement. The implicit discount rate is low, ranging from 1.5 to 3%, depending on model specification. This is consistent with Hassett and Metcalf (1993) and Metcalf and Rosenthal (1995), and with the fact that our scenarios contain no uncertainty. Respondents who feel completely uncertain about future energy prices are more likely to select the status quo (no renovations) in any given choice task and weight the costs of the investments more heavily than the financial gains (subsidies and savings on the energy bills). Renovations are more likely when respondents believe that climate change considerations are important determinants of home renovations. 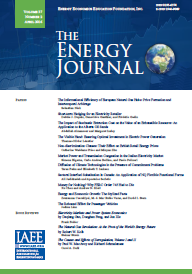 Published in Volume 34, Number 1 of The Quarterly Journal of the IAEE's Energy Economics Education Foundation.